MOD. invites you to the launch of our second exhibition, WAGING PEACE. 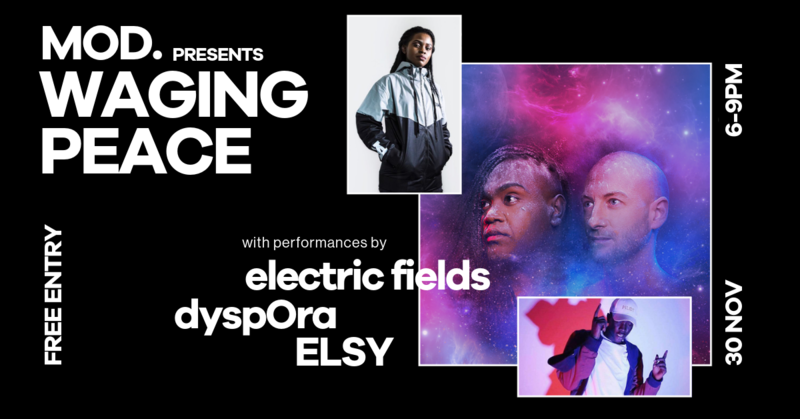 Multi-award winning Electric Fields create a striking and haunting merging of living traditional culture with electronic music, bringing moments of breathtaking beauty and power to the stage. Featuring the rare and beautiful voice of Zaachariaha Fielding, who often sings in his traditional languages of the Anangu people. Known for his versatility, sonic activism and dynamic lyrical abilities, award winning hip-hop artist & producer DyspOra views music as the mechanism to facilitate today’s racial & social relations. The 24 year old recently released his long awaited rebelution tape to critical acclaim. With a motto of “singing to inspire the living”, ELSY delivers a soulful aura through her music, by pioneering a natural expression of conscious and impactful lyrics. Compared to artists such as Lauryn Hill and SZA, ELSY has recently performed alongside artists such as Tkay Maidza, Skepta and Lady Leshur. RSVP for free via Eventbrite and arrive before 6.30pm on the night to receive $2 off your first drink!